The Cooper Union has been ranked as one of the top ten “Best Value” private colleges in the United States by The Princeton Review, which released its annual list today. Sharing company with Harvard College, Princeton University and Swarthmore College, The Cooper Union has been ranked 6th, ahead of the Massachusetts Institute of Technology and Amherst College. The Cooper Union became eligible for the list for the first time because it will receive revenue from tuition in the 2014-15 academic year. It will offer all enrolled students a half-tuition scholarship along with additional need-based aid to help cover the total cost of attendance, including tuition and fees, all living expenses, and supplies. "The Cooper Union always has offered exceptionally good value to students because our financial resources are concentrated on providing intensive instruction in a conservatory-style setting in art, architecture, engineering and the humanities,” said Jamshed Bharucha, president of The Cooper Union. “We are committed to sustaining a half-tuition scholarship for all students and to providing need-based aid to help cover the full cost of attendance in order to ensure that students from all economic backgrounds receive the highest quality, most cost-effective learning experience." The Cooper Union was mentioned specifically when the Today Show featured the rankings. The 2014 list identifies 150 colleges (75 public and 75 private) that The Princeton Review designates as, "truly the most exceptional in the nation at delivering great academics combined with affordable cost." The methodology used examines more than 30 data points covering academics, cost, and financial aid. The company chose the 150 schools from 650 colleges and universities at which it conducted institutional and student surveys from the fall of 2012 to the fall of 2013. 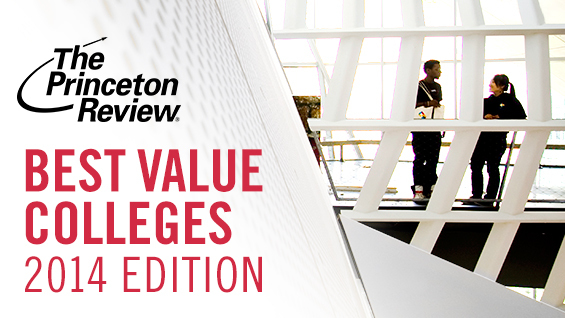 "We strongly recommend and salute the colleges we present here for all that they do to help their students with need afford to attend them while delivering an amazing college experience that's worth every penny," writes The Princeton Review.